This felt flower is attached to a flexible wire stem and then wire is felted again with wool. You can gently straighten out the flower until you are happy with the arrangement. 14 inches tall. 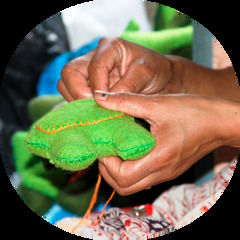 Hamro Village is a wholesaler brand of fair trade products handcrafted in Nepal. The majestic Himalayas, the rugged mountains and the flora and fauna form the character of Nepal’s 47 different ethnic groups, and this is reflected in distinctiveness of Hamro products. They believe in transparency based on open dialogue and respect with artisans to ensure better working conditions and greater equity.